Being a prairie girl, rarely have I spotted an eagle. Usually it has been in spring or late fall as they follow the migratory path of geese. Each sighting is inspiring! These majestic birds are leaders in every way. It is no wonder the bible references eagles often. … run and not grow weary. Eagles fly at elevations up to 10,000 feet. Though cranes, vultures and geese fly higher than eagles, eagles soar effortless on upper level currents. When other birds take cover from a coming storm, eagles seizes thermal opportunities for updraft and lift. Great leaders are problem solvers! They don’t hang around on the ground complaining. Leaders pick up the challenge and find resolutions. They are high flyers! Leaders thrive on challenges using them as instruments to propel both themselves and others forward. There were a handful of things the psalmist found difficult to comprehend; the first one, mentioned is how eagles fly. Eagles are monogamous, generally mating for life. When a male eagle wants to mate, she first tests his commitment. Then and only then, will she allow him to mate with her. Developing this high level of commitment ensures relationship that will endure through all seasons. An eagle’s nest can weigh a ton or more. That’s a lot of nest! Both eagles and leaders take seriously the responsibility of those they have been entrusted with. They develop an environment of care and protection. “Is it at your command that the eagle mounts up and makes his nest on high? On the cliff he dwells and lodges, upon the rocky crag, an inaccessible place. 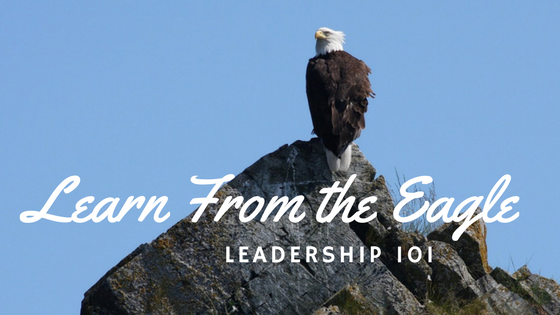 Leaders are long-sighted – “eagle-eyed”! They have a capacity to see what others miss! Sight is the eagle’s strongest sense. I read once that an eagle can see a dime in the grass a mile away. True or not, I don’t know. Eagles do have a wider range of vision and see about five times better than humans. They also see a wider spectrum of colour than we do. Godly leaders continually have divine foresight to see and perceive what is not humanly possible. They are able to see opportunities, detect threats or spot out fresh food to nourish the young. Leaders Don’t Eat Dead Meat! Eagles, unlike vultures, always eat and feed their young fresh food. Leaders maintain personal strength by guarding their eyes, ears and hearts carefully. The media offers up a lot of “dead meat” these days! Godly leaders intentionally study and read the word, participate in private and corporate worship and enjoy authentic relationship. To help strengthen and train their young, a mother eagle throws the eaglet out of the nest. As they shriek in fear, father eagle flies underneath catching them and bringing them back to safety. Together they continue the process until the eaglet is strong and confident to fly and soar on its own. Leaders use their strength to strengthen others. They guide those around them to grow, sometimes even pushing them beyond their comfort zone. In so doing godly leaders are willing to do whatever is necessary to train and elevate others, equipping them to soar. The life-span of an eagle is thirty to forty years, much longer than most birds. Perhaps, that is why the psalmist thanks God for “renewing” our years like an eagle. A strong leader examines his life carefully in view of eternity. He will look back and take stock, ignoring neither the good nor bad experiences and learning from both. He will create checks and balances for personal and professional growth. Proper periods of rest, nourishing food, and adequate exercise are conscious choices he makes in his renewal process. He willingly maintains relationships of genuine accountability. Inspired by these amazing birds, my focus shifts instinctively from the created to the Creator of all things. I want to learn well, what He is teaching me in these moments.